American football fans are among the most fervent of any sports this side of European soccer. The term “fan” is short for fanatic, which is an indication of the sort of behavior that is accepted and even expected. Fans might paint their faces with the colors of their teams or wear jerseys and other merchandise showing their allegiance. These fans might wave pennants or hold up signs to their favorite players, or participate in stadium-wide cheers or jeers. American college football is known for a greater hoopla and fanfare. College football brings a younger audience of college students, along with longtime alumni. There are many fan traditions, often unique to a particular school. 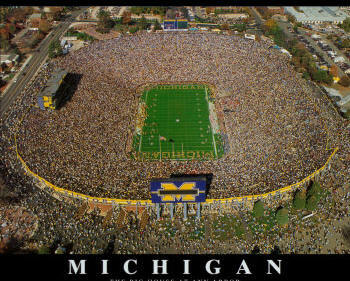 The Michigan Wolverines and Tennessee Volunteers each have a stadium that seats over 100,000 fans at a time. At Texas A&M University, walk on students once were chosen to be the 12th Man, covering kickoffs during real games. Traditional rivalries are quite important to college football fans. Many of these have taken place since the late 1800′s. Fans argue about which rivarly is the greatest. The Michigan-Ohio State game has been played since 1897. ESPN has called it the greatest rivalry in college football. This last year, it pitted the #1 and #2 ranked teams. The Texas/OU game takes place at the Cotton Bowl in Dallas, Texas, roughly equidistant from both schools. This takes place during the state fair of Texas every year. Both of these teams have won national championships since 2000 and Dallas fills up every year with rabid fans from either side. Other fans will say that Auburn-Alabama or Army-Navy represent the best college rivalry. College boosters tend to be alumni of a particular university. Boosters donate money to college sports programs, helping to pay for facilities, equipment or coaches salaries. Alumni associations form to gather money from small donors, while rich boosters might pay tens of thousands of dollars at a time to their favorite programs. Boosters have been known to pool money to buy out the contracts of head coaches they do not like. In this way, college boosters wield significant power in deciding the future of programs and coaching careers. Some boosters give illegal payments to college players, which is monitored and regulated by the NCAA rules committee. Rules are enforced to maintain the integrity of the “student athlete” concept. The NCAA fears that boosters who pay players might also ask those players to shave points or lose on purpose, to help that booster win a wager for a larger sum of money. This is never more evident than when the winter comes during the latter parts of the NFL season, while sold out crowds still cheer their favorite team to victory. Many NFL fans enjoy tailgating before the game. They come hours early to the stadium, where they park outside and cook a variety of foods. This allows the fans camaraderie with their fellow supporters while enjoying beer, grilled meats, hamburgers and hot dogs. Cleveland Browns fans gather in the Dawg Pound, the east end of Cleveland Browns Stadium. 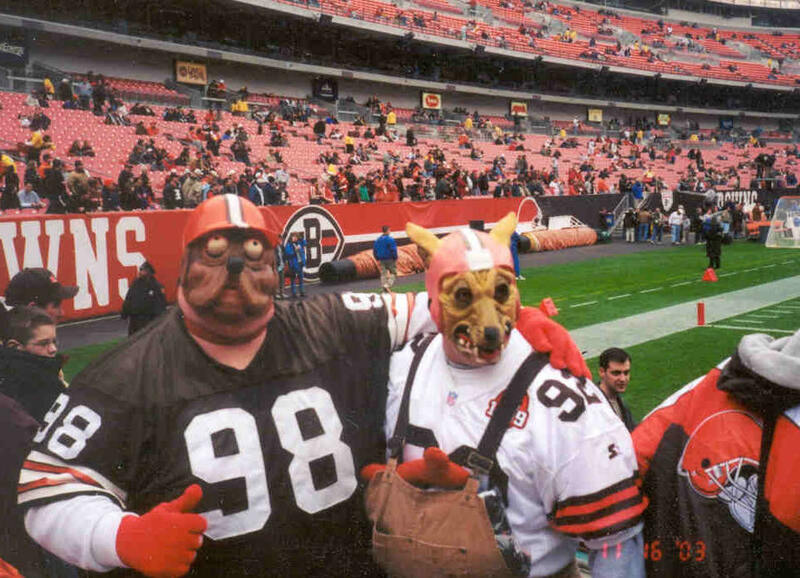 Fans in the Dawg Pound wear Browns paraphenalia and follow the leader of the Big Dawg, a fan who wears a dog mask and waves a giant leg bone. When Art Modell announced in 1995 that he would move the Browns to Baltimore, Browns fans put enough pressure on the NFL that it eventually stripped the name “Browns” from Modell’s franchise, reserving the name and uniforms for the next Cleveland franchise. Oakland Raiders have their own version of the Dawg Pound, named the Black Hole. This refers to one end of their stadium, where fans dress in the Raiders’ black-and-silver. They often wear spiked shoulder pads and paint their faces black. They might wear black hoods and hold scythes, or simply dress as Hell Angels bikers. The Black Hole is not for the family, or the faint of heart. Green Bay Packers fans are a little less menacing. Many are known to wear styrofoam hats that look like chunks of Swizz cheese, in reference to Wisconsin’s dairy industry. These Cheeseheads are one of the most supportive fandoms in sports, perhaps because the Green Bay Packers are a publicly owned organization, unlike most NFL teams. Green Bay’s citizens are likely to own stock in their local franchise. Whenever the Packers score a touchdown at a home game, their players are prone to jump into the stands to celebrate with fans. This is known as the Lambeau Leap. A football widow is a woman who sees less of her husband during the football season, because he is busy watching football on Saturday and Sunday afternoons, and Monday nights. This is a humorous term, though no doubt wives across America take the joke a little more seriously than their fanatical husbands do. In the past ten or fifteen years, in particular with the development and growth of the internet, a new kind of football fan has appeared. With the mainstream popularity of fantasy football, a fan may not necessarily support a team, but might support a singular player. This is because fantasy football players single players to their own fantasy squads, to be used in competition against friends and rivals. Performance is based on individual player statistics, instead of team performance. Fantasy NFL Football Leagues. They list several places at which you can play, and provide information about each of them. While many traditional football fans view fantasy football as distracting from the true purpose of football, the NFL’s meteoric rise in popularity in the past fifteen years is closely tied to this new form of fandom. Many fans find a way to support their local team, but still cheer for individual players on other teams.